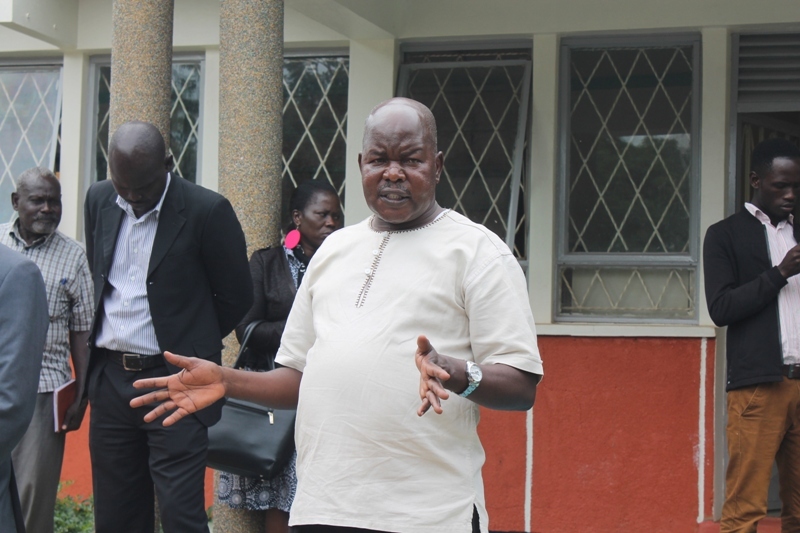 Gulu mayor George Labeja (centre) addresses journalists after the incident. Courtesy photo. GULU: Three people were injured after lightning struck Gulu Municipal Council Yard buildings on Tuesday. The 4pm incident followed a one-hour downpour characterized by strong winds as well as thick and dark clouds. The injured included Denis Acire a teacher at Laliya Primary School who had visited a friend at Gulu Municipal Education Department. Acire fell unconscious but later regained his consciousness. Others injured are Edmond Opiyo, the Gulu Municipal Council procurement officer, and Ruth Monday, a Community Development Officer. “When I regained consciousness, I heard that another person had been injured. We had to arrange and rush him to hospital,” Opiyo said. Acire was on Thursday discharged from the clinic and medics say that he is out of danger. “ I think I survived because I was putting on shoes with rubber sole,” Acire said, soon after being discharged. Meanwhile, Monday is still nursing injuries. She said she saw no need to visit a health facility after the lightning struck but added that the pain has persisted. “I have to see a doctor now because even after taking milk upon advise from friends, I still feel a lot of pain in my right hand and I have general body weakness,” Monday said. The lightning also destroyed four laptops, three desktops and a printer bringing work to a standstill. Electricity wires were also vandalized and the meter box burnt. According to Gulu Municipality mayor George Labeja, the Council yard has no lightning arrester but there are plans to install four during the renovation exercise that is ongoing. “We plan to install four lightning arresters valued at Shs3.4 million each to avoid this unfortunate situation from happening again,” Labeja told our reporter. Lightning strikes killed more than 205 primary school children between 2012 and 2013. As a result, in July 2016, Uganda National Meteorological Authority (UNMA) through the United Nations Development Programme-supported Strengthening Climate Information and Early Warning Systems Project installed a network of five all-in-one Total Solutions Automatic Weather Stations (TSAWS) which included a total lightning detection system, to improve weather reports. This technology was also meant to issue early warnings for fast-acting lightning storms, connect Uganda with regional monitoring systems and improve the country’s overall sustainability of investments in climate information services. However, the TSAWSs work in concert with six already existing lightning sensors from the “Pilot Project on Severe Weather Now-casting Based on Lightning Detection in Lake Victoria Region only.Uganda has eleven TSAWS sensors. But despite the innovation, more people continue to be hit by lightning around the country. In 2015, experts attending the 13 governing council of the NAM S & T, the Centre for Science and Technology of the Non-aligned and other developing countries in Kampala advised Ugandan schools to install lightning rods, down conductors, and other lightning equipment to carry lightning’s electricity safely into the ground and prevent shocks and deaths. Research shows that Uganda suffers approximately 70 lightning strikes per kilometer a year. Scientists have time and again advised the public to avoid electronic equipment, especially when it is raining. This is because lightning can travel through electrical systems such as radio and television reception systems, corded phones, concrete floors and walls. The creation of lightning is a complicated process and there is still debate about exactly how a cloud builds up electrical charges and how lightning forms.